Bloq, a leading Blockchain technology company, today announced the upcoming launch of Metronome (“MTN”), the world’s first cross-Blockchain cryptocurrency. Metronome is a next generation cryptocurrency with a predictable and autonomously managed token supply, built for store-of-value, payment and transactional use cases. 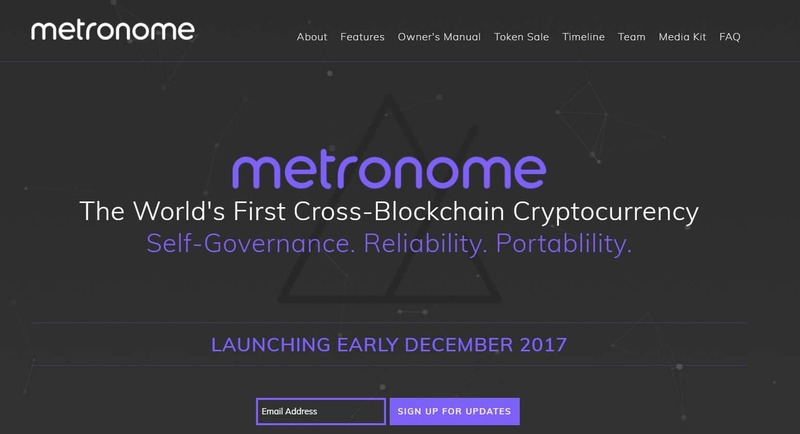 Metronome is expected to launch in early December 2017. Self-Governance: MTN tokens will be managed by its user community, with the system managed by autonomous smart contracts. There will be no third party with any special privileges either within the system or in the MTN marketplace. Reliability: Metronome was architected to provide rapid market price discovery, prioritize predictability and provide a steadiness to the MTN token supply over time. Portability: Metronome’s cross-Blockchain capability uses a proof-of-exit receipt when users leave one Blockchain, which enables them to enter another. The MTN token will be issued first on the Ethereum network, with Ethereum Classic, Rootstock on Bitcoin and Qtum support expected to follow. This will allow users to select the Blockchain that suits their requirements for governance and security, or even upgrade the MTN contract if needed. For more information, and to download the Metronome Owner’s Manual, please visit metronome.io. “We believe that individuals will be empowered by a currency designed with self-governance as a first-order variable. Further, institutions can more confidently enter the cryptocurrency category, as Metronome will enable them to innovate and develop reimagined financial products.” said Matthew Roszak, co-founder and chairman of Bloq. Bloq is a leading Blockchain technology company, providing enterprise-grade software, services and support through its BloqEnterprise and BloqThink suite of solutions. Bloq is led by a world-class team of Blockchain developers, entrepreneurs and investors. BloqLabs originates, sponsors and supports innovations in leading edge decentralized networks and applications. For more information, please visit bloq.com, and follow us on Twitter: @bloqinc.